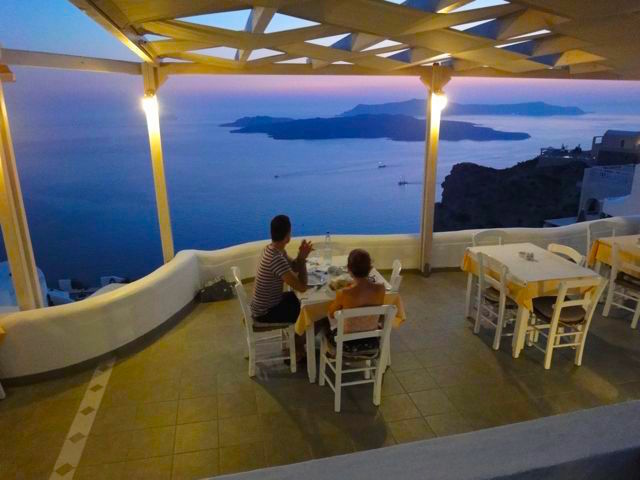 Let's be clear about eating in Santorini. Chances are you will be eating tourist food. Santorini is a tourist island and the restaurants have one purpose and that is to sell food to tourists. Yes there are restaurants that locals eat at but it is unlikely that you will stumble upon them on your own by walking the streets of Oia and Fira. This does not mean that the food is bad because it is made for tourists. On the contrary. Some of the tourist restaurants make very good food and are proud of it and while some may see their restaurants as feeding troughs with cash registers, and tourists as cattle that can be satisfied with mousaka and pastitsio, others see tourists as guests and go out of their way to find the best ingredients to introduce them to the unique cuisine of the island. Santorini is an odd island and its food is a combination of climatic factors and the tastes of those who have occupied and lived here. In Fira and Oia you can find whatever you want and at whatever price you can afford or not afford. For good food at reasonable prices a car is useful. As a rule we try to stay away from places that are overtly commercial and go to the family run fish taverns located near the smaller beaches and communities. There are plenty of places to eat in Fira and Oia but we did not try them, mainly because our visits to the two towns were more like photo-sessions mixed with shopping for the girls. When you are in Santorini there are several things you have to eat because most likely you won't find them anywhere else. 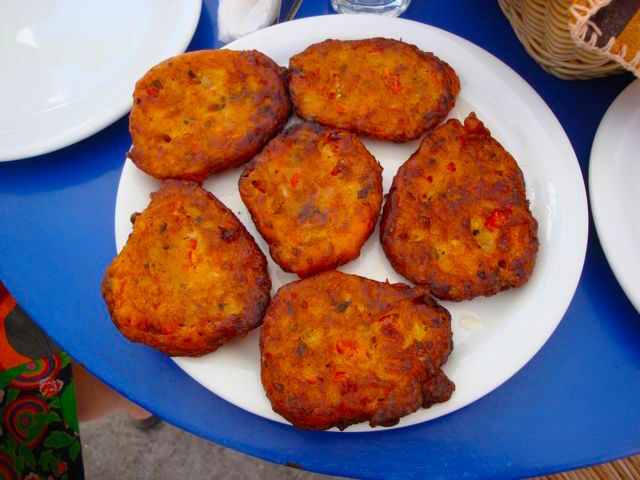 Number One are the tomato-keftedes which are deep-fried patties of Santorini tomatoes, onions, flour and whatever ingredient each restaurant puts in that makes their's special. Probably there will be someone in your entourage who will eat these every meal. Also unique to Santorini is their fava which are yellow split-peas, similar to the familiar green split-pea soup but served with onions and olive oil and eaten with bread. The white eggplants are also unique to the island, though of course now you can find them all over the world. There is something called a katsouni which is like a cucumber but has a dryer texture and a different taste. Capers are also grown here as are a round zucchini squash and a small watermelon. But the most important food on the island is the Santorini cherry tomato which because it rains so little (like not at all in the summer) will probably be the most intensely delicious tomato you have ever eaten. When you go to a restaurant insist on Santorini tomatoes. You can recognize them because they are small and ridged. Everything else is pretty much the same as you will find on other islands in the Cyclades and in Athens though some restaurants have a few things they specialize in and it does not hurt to ask your waiter what that is. The best food product in Santorini is the wine and there is no reason to drink anything but Santorini wine unless you are drinking Santorini tsipuro or you don't drink. Metaxi Mas had been recommended by just about everyone we came into contact with in our travels around the island. We had called the night before to make a reservation but they were full which is why we ended up at Kyria Niki's. 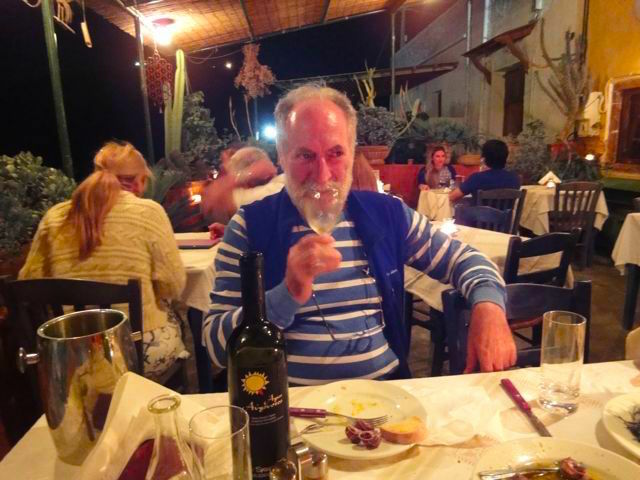 The next night my friends Dimitri and Patricia from Ocean Wave Tours had invited us to dinner and said they had made reservations at Metaxi Mas and then later that day when we went to visit Antonis at Artspace winery he told us he was going there as well. Antonis had discovered on Facebook that I was in Santorini and through clever detective work had tracked us down at the Volcano View Villas and sent us ten bottles of wine from his winery in thanks for the review I had written ten years ago which was a wonderful and generous gift except that we had come to Santorini carrying nothing but a small backpack which meant that we had to either drink all the wine before we left, or try to find a hard suitcase to transport it back to Athens. After hours of searching we managed to find a bright red suitcase which would fit most of the wine. We figured we could sit on our terrace at the hotel and drink at least one bottle before dinner which we did. So when Dimitris and Patricia showed up at the hotel in their Puegeot convertible we were ready to party. We arrived at Metaxi Mas, which you get to by walking through the yards of a big church, to find Antonis waiting for us at a big table where we were joined by several friends, a bottle of tsipuro and many bottles of Artspace wine. Andrea barely made it through the appetisers which included pan fried crusted feta cheese with honey, saligaria (Cretan style snails), Santorini fava, a pomegranate salad with fresh spinach and lettuce, walnuts, dill, parmesan and who knows what else. By the time the main courses came Andrea was nodding out and Patricia took her home. Her place was taken by the village priest and we continued to eat and drink through the night. I believe I had Beef Filet with Vinsanto Wine and Mushroom Sauce. I can't remember exactly. I just remember that it was extraordinarily delicious as was everything that my friends were putting in front of me to eat. Patricia came back in time for desert and to drive us home. They had an early morning tour and I had a flight to Athens and then a 12 hour ferry trip to Lesvos. But through the haze of my memories of that night I can tell you that Metaxi Mas is one restaurant that you should go to. You will need a reservation which you can do by phone(22860 31323) or e-mail. By the way it is not a strictly Santorini restaurant. 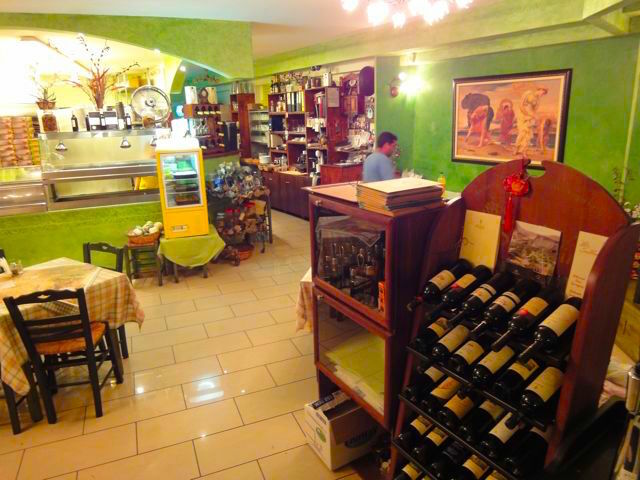 It is a Santorini-Cretan restaurant with a bit of Italian thrown in. Most likely this will be the best meal of the trip so maybe go here first so you have time to go again. 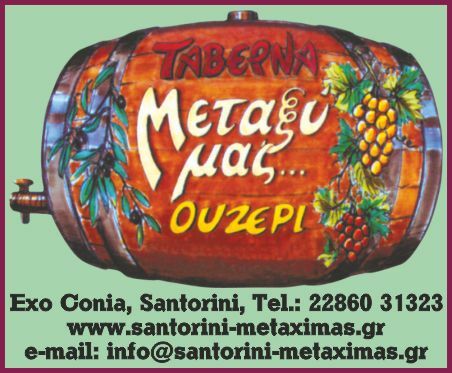 Metaxi Mas is in the village of Exo Gonia between Pyrgos, Kamari and Fira. If you don't have a car take a taxi. The restaurant can call one for you when it is time to go home. I really had to search to find a photo for this restaurant. I must have taken fifty that night and every one was out of focus for some reason. 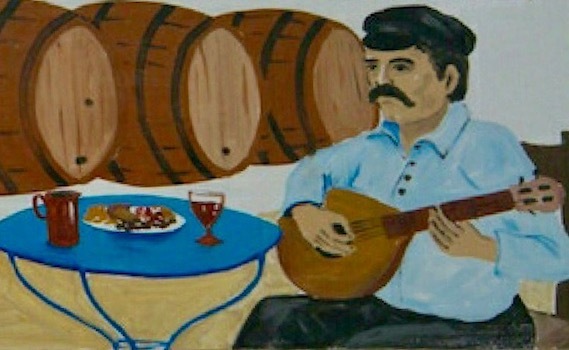 This is the best one and it is of Antonis Argiros of Artspace Winery. Kyria Niki's is a traditional psistaria (grill house) taverna in an un-romantic setting, not overlooking the volcano, or on a beautiful beach, but on the main road from Fira to the airport among bakeries, shops, light industry and whizzing cars. We drove here at night and were ready to veto the place because of its location but once we went inside we were pleasantly surprised and actually ended up feeling right at home in this environment which was like being in the outskirts of Athens or maybe Lavrion or Keratea. Kyria Niki, the owner chef, has put together a large menu of Santorini specialties for reasonable prices and most of the people here were Greek. In fact I got the feeling that the only tourists here just wandered in because they were lost and hungry and just happened to luck out. To this point we had eaten plenty of good food but had not yet found the restaurant that knocked us out, the small un-touristy place that would earn me praise from travelers who would not have discovered it otherwise. Until we went to Pirgos, an inland village with a small square and a labyrinth of houses topped by a kastro. Most people opt for the taverna or the ouzeri in the square but we were intrigued by the sign that said To Penelope's. We found Penelope in a small hole-in-the-wall restaurant next to a church and realized that this has to be what we were looking for. Penelope is not from Santorini. She is from Arta, a town on the mainland but moved here with her husband who is from the village. We were the only customers so we had her full attention and she made us the best tomato keftdes in the world. Yes. IN THE WORLD. Also a beautiful Greek salad with Santorini tomatoes, feta and caper leaves, and delicious home-made dolmades (stuffed grape leaves), all served with bread from the local bakery that was made with wheat and corn flower. 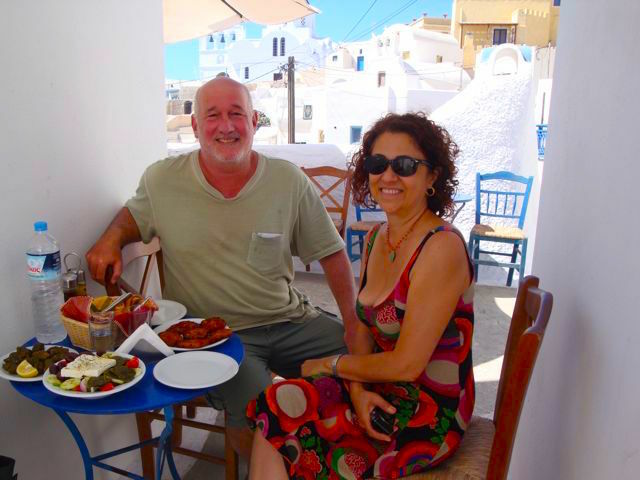 My only regret was that we did not sample more of her dishes because that night we were planning to go to Metaxi Mas which was rumoured to be the greatest restaurant in the history of Santorini, and we did not want to arrive there well fed. 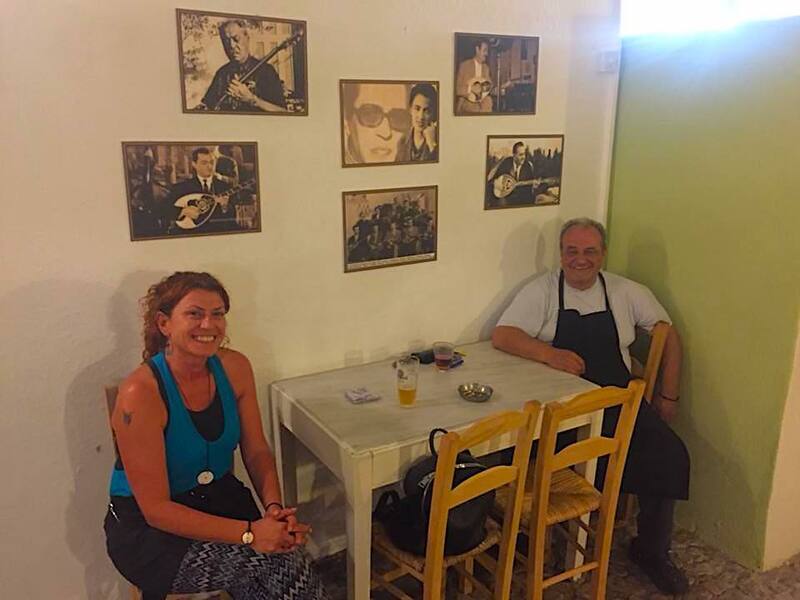 Anyway I am sure to get flak from some of the x-pat locals for letting the cat out of the bag but if you want a simple, delicious, meal of Santorini specialties in a quiet setting go to Pirgos and wander the back streets until you stumble upon Penelope's. While you are there go to the traditional food shop in the square and check it out. 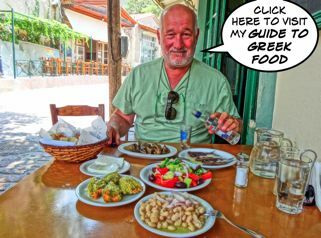 He has a great selection of Santorini wines, ouzo, tsipuro, canned fruits, and even seeds for the tomatoes, fava and squash. When our friend Antonis from Art Space Winery said to meet us at Afro for dinner we were worried. 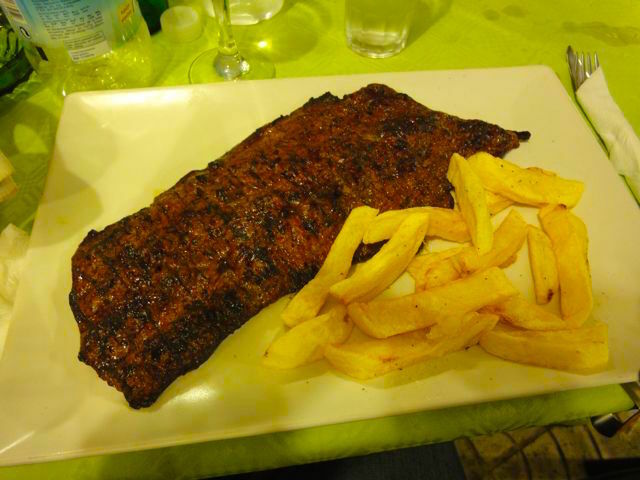 We wanted to eat at the best traditional and simple restaurants we could find on this, the most touristy island, and the name Afro sounded like it was going to serve soul food or Greek food with a modern touch served with a background of soul, rap or reggae music. What we found was the most authentic, simple, traditional restaurant like something you would find in Lesvos. Not surprising since the owner, Christos is from the village of Montemados in Lesvos. We spent 2 nights here drinking Artspace wine and eating the best seafood of the summer including fresh sea urchins, lakerda Lesvos style, grilled skaros (one of my favorite fish and not very common), sun-dried and grilled skoumbri (mackerel), cuttle-fish and giant squid grilled, and the best tomato-keftedes of the trip. Christos plays old rembetika and laika music, and even carries the local Donkey Beer. I also highly recommend their grilled local white eggplant, taramasalata, regasalata (like tarama but made with smoked herring, and their orzo with lobster sauce, which we didn't order but he gave us a taste of. If you are tired of fancy, expensive restaurants and want to eat somewhere that is like eating at the best place on a lesser known island then I highly recommend Afro. It is in Perivolos in the opposite direction of Perissa, towards the end of the road, close to the old Tomato factory that is now the 41 club. They are open for lunch and dinner. They are one of the few restaurants that serves Artspace wine. You won't need a reservation. This place is undiscovered. Below the ancient city, on the beach at Akrotiri is a nice fish taverna called Delfinia where you can sit right on the sea and eat fresh fish. It is reasonably priced and even the locals eat here. 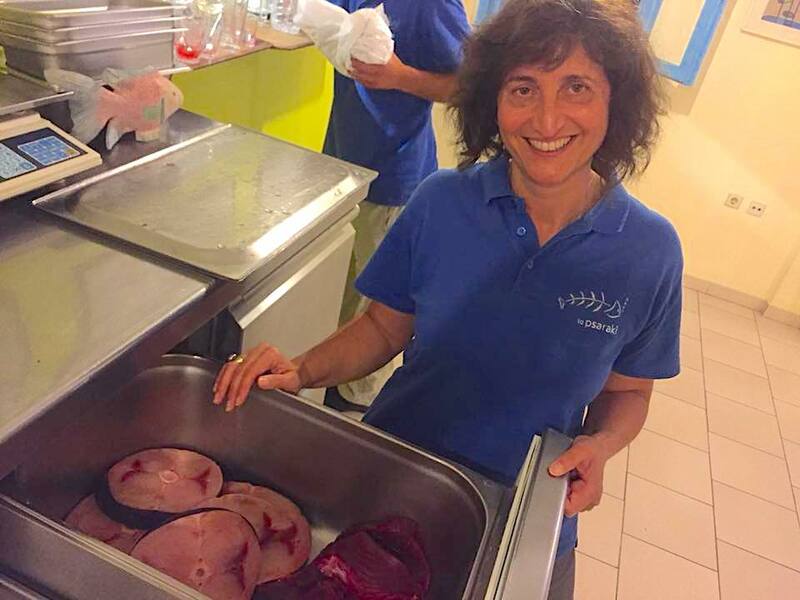 Kostas and Fanis, are two brothers who serve the food and also catch the fish which is cooked by their mother Evangelia. Taverna Geromanolis was the first restaurant I saw in Santorini that looked like something you’d find in Kea or some small mountainous village with no tourists. I was thrilled. I came to Santorini to work for the summer season (season seems like the wrong word- it’s living in Santorini for seven months followed by a 5 month long winter vacation back in Athens). Santorini is one of the most expensive islands in Greece and I figured I would be living off of spanakopita and Oreos until November, so when I saw the normal Greek taverna prices on the Geromanolis menu I was relieved. The tavern is in Megalochori, a small town about 5 kilometers south of Fira. I have yet to explore the village but it is about a three minute drive from my house so I should be able to make it over there for a quick look around in the next half year or so. Or not, knowing me. Anyways. The place is obviously family run- I didn’t ask but everyone was calling each other mother and father so I assume that’s what that meant. It was early in the season so the menu was limited to appetizers, salads and tis oras (that’s meat on the grill). The woman working told me they had paidakia (lamb chops) and my mouth watered but I was getting food to go and only an animal would order lamb chops to sit at home and eat alone so I opted for tzatziki, a horiatiki salata and some tomatokeftedes (those are fried tomato balls- a specialty on the island). Everything was great. The tzatziki was good (okay that’s easy, if your tzatziki is not good there is a serious problem somewhere in the kitchen), the horiatiki was nice with good tomatoes and not those weird pulpy pink disaster spheres you sometimes find in the early spring and winter. Also it had these giant green funny shaped olives that were fun. Olives are always fun though, aren’t they? The tomatokeftedes were great, definitely made to order and nice and chunky with onions, tomatoes, etc. I will definitely be going back, probably 5 times a week for the next 7 months. Here's a possible addition to restaurants in Santorini (& I know you have a lot of them listed). We had a great meal in October at Salt & Pepper in Fira. It's on the main driving street (Eikostis Pemptis Martiou) & just short walk (3-5 mins) north of the square. It's on the west side of the street & is quite small. Owned by the chef & his wife, who is also the maitre d' & waitress, it seats about 20. We were lucky to walk in early & get a table without a reservation, but saw many folks get turned away. So, if you post it, advise to make a reservation a day or two in advance. The chef creates different meals every night. Ours, although not large, was just 45€, included a salad, two entrees & wine, all delicious (we spent a year in Greece, so I don't say this lightly!). Quite a bargain for Santorini & its a white tablecloth kind of place. Much attention paid to us & all patrons by the owners/staff. Hope you are well & doing your best to enjoy Carrboro! “Skaramagas” Traditional Family Tavern, fresh fish, fava, and the best tomato-fritters on the island, Monolithos opposite the Airport right next to the old tomato factory, nice sandy beach and shallow water with umbrellas and cabins to get changed. “Dolphins” Captain Giorgos the father, his sons Kostas and Fanis supply their Tavern daily with fresh fish, Akrotiri a few meters before the parking for the Red Beach. 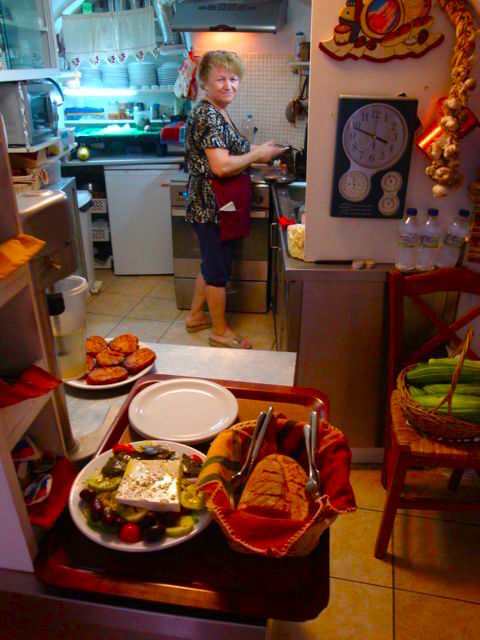 “Mamas” The best breakfast on the island, omelets with spinach and feta cheese!!! In Fira, right next to the Taxi Station on the main road. “Kyra Niki’s” Local specialties lamb and pork on charcoal various salads with Santorini products, Karterados, 10 min walk from Fira on the main road to the Airport. “Almyra” Large menue for all the tastes and reasonable prices, on the promenade of Kamari. “Ouzeri” Greek Kitchen, Mezedes (Greek word for starters) and dishes from all over the country, Fira Shopping center Fabrika. “Metaxi Mas” Mezedes for Ouzo, Raki from Crete, and Wine, Exo Gonia, opposite the large Byzantine church with the clay tiles roof. “Marmita” Greek kitchen, nouvelle cuisine, Chrisanthos, chef and owner he is not just cooking he is creating!! In the village center of Megalochori, highly recommended. “Nychteri” Gourmet dishes and more, Kamari on the promenade close to the parking place. “Ochre” The best sunset view with hundreds wines from all over the world, Oia at the very end of the island. Be sure to visit Ginger in Firostefani which some say is the best sushi restaurant in Greece. Some have said it is the best sushi restaurant anywhere! Monolithos near the Airport. It is small bay shallow water, fine sand some trees you can lie under there are also umbrellas and benches to hire and a small shop to get cold drinks and ice cream or a snack. Captain Dimitris . It is on the road to the light house before the Village of Akrotiri turn right3 Km. I start going to this place this winter it is like Skaramagas the family runs the place fresh fish,varius mezedes (starters) and home made wine rose or white that you can drink a barrel! !